The Retail Distribution Review (RDR) came into effect in January 2013, and one of its key objectives was to stop fund companies from paying commissions to advisers. Instead, advisers were required to have an up-front, transparent agreement with each of their clients about the cost of financial advice and the fees they would charge for this advice. The removal of commission payments from fund fees has seen a plethora of new share classes launched, commonly referred to as clean share classes; unlike bundled share classes, clean share classes do not include fees taken by advisers and platforms for their role in distribution. Further, as the cost of active management has been laid bare, investors have increasingly turned to passively managed funds, on the view that not all actively managed funds justify their fees. The RDR also removed a previous stumbling block that had kept many advisers from using passive funds, as they paid low or even no commissions. There is no doubt that the RDR has influenced the marketplace, in a good way. There is much work to be done, though, for all retail investors to benefit fully from the legislation. The average asset-weighted fee for actively managed equity funds across our sample has fallen by 18% since 2013, on an asset-weighted basis, compared with a 28% decline at passive funds. Since the introduction of the RDR, almost all new money inflows have been directed to the cheaper clean share classes, and so it would be tempting to dismiss the compression in fees over the analysis period as simply a mathematical inevitability. However, we believe this is an incorrect interpretation. Indeed, we have also observed signs of fee compression in clean share classes throughout the period, implying there has been competition between fund providers, and that investors have discriminated in terms of price and switched assets from expensive share classes to cheaper clean share classes. Some of the biggest savings for investors in actively managed funds can be seen in the large-cap equity categories. Both the US and UK large-cap equity categories have seen an average 20% reduction in fees since the RDR, when looking at clean and bundled share classes combined. These are two areas that are likely to represent a significant allocation in most investors' portfolios—UK for the home bias and US because it’s the largest superpower globally – and the analysis period has coincided with a strong bull market for US equities. While these fee reductions in active strategies are significant, they are trumped by those in passive offerings. Passive funds have reduced already-low fees by 30% in the UK large-cap equity category, by 32% in the Japan large-cap equity category, and by 34% in the European large-cap equity category. Passive funds in the US large-cap equity category have come down by a staggering 50%. Clearly, cheap can get cheaper. Assets in passive US large-cap strategies in our sample quadrupled over the analysis period, whereas assets held by active US large-cap managers grew by 30%. That reflects the challenge active managers face in beating the most efficient equity market in the world and the realisation by investors that, for the most part, they’re paying over the odds at actively managed US equity funds for subpar performance. With the cost of active management becoming much clearer since the introduction of the RDR, investors are now voting with their feet in this market more than any other. Passive strategies may only deliver benchmark returns in US equities, but with fees as low as 0.05% for S&P 500 exposure, it becomes an easy investment decision for core exposure when so few active managers can achieve a better outcome than a passive fund. In 2013, passive strategies in US large-cap equities in our sample data accounted for just over half of assets; by mid-2018, that approached 80% of assets. For the most part, fees have come down at actively managed fixed-income funds but to a lesser degree. The average fee for actively managed bond funds across our sample of investment categories and UK retail-friendly share classes fell by 10% since 2013, on an asset-weighted basis. 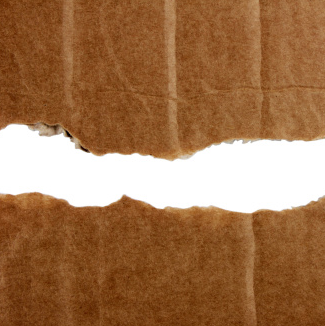 Overall, it seems that when it comes to fixed income, active fund houses have not felt the need to compete as aggressively either between themselves or against the rising tide of passives. One likely explanation is the different speeds at which the development and growth of equity and fixed-income passive fund segments has taken place. In 2013, passively managed equity funds in our selected group of categories and retail-friendly share classes had a market share of one third; roll forward four and a half years, and they were close to parity with actively managed equity funds, and it's only a matter of time before they take the lead. In fact, in the case of UK large cap and, above all, US large cap, passive was already ahead of active in 2013 and further strengthened its status in subsequent years, with market shares of 58% and 78%, respectively, in 2018. 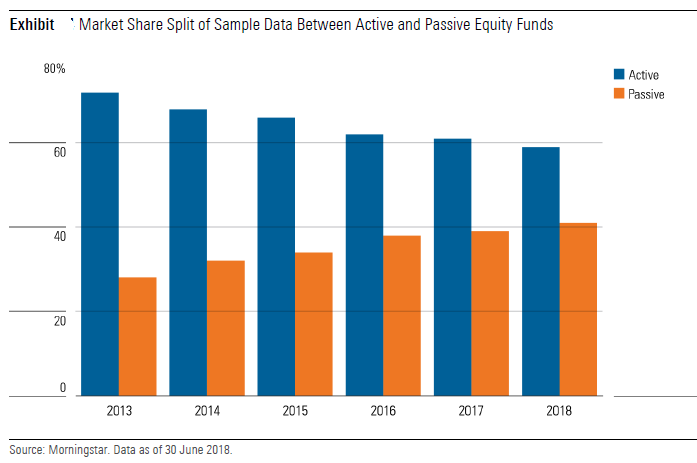 This trend in favour of passive has been even more pronounced in the group of fixed-income funds under analysis, which have moved from an 80:20 split in favour of active management to nearly 50% invested in passive funds. ETFs have proved a key driving force, affording access to areas such as emerging markets or high yield which had been ignored by the mutual fund index fund industry. Still, even at this stage, where passive really dominates is in UK government bond exposures. The passive market share in 2018 for conventional UK gilt funds in our sample was 76%, and for inflation-linked bonds 59%. There is no doubt that the RDR has influenced the marketplace, in a good way. There is greater transparency of fees for the investor, and this has brought to the fore the issue of value for money. Debate continues in the industry on the best way to assess value at a fund; without doubt, though, investors are more empowered with better knowledge of the cost of their investments. Passive fund providers have, for the most part, responded better and more quickly to the challenge; despite already being the cheaper option, they have cut fees at clean share classes to become cheaper still. Further, they have launched multiple funds to give access to areas of the market—both equity and fixed income—that had previously been inaccessible to retail investors. There are still significant legacy assets invested in bundled share classes, where investors are paying over the odds. Here, the traditional index fund providers have disappointed, with fees edging up at tracker funds. The response thus far from the industry to the RDR has, overall, been positive for new money being invested into funds. There is much work to be done, though, for all retail investors to benefit fully from the legislation, and we hope now that the FCA has issued its guidance on the outstanding issues, those legacy assets can start to move to clean share classes, in the best interests of those investors. One-Stop-Shop Financial Advice: Best Practice or Bad Idea? Is There Still an Advice Gap?